In 2006 while living in France with her family, 12-year-old Esther Earl was diagnosed with thyroid cancer, a type that is never diagnosed in children. 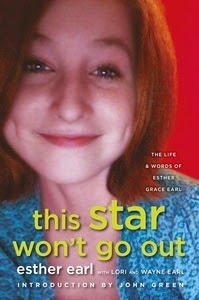 This book documents her life during her illness till her death. Excerpts from the journals that she filled during that time appear, along with entries from family, nursing staff and other carers. An aspiring writer amongst other things, there are samples of her poems, and early drafts of her fiction stories. These build the framework for the retelling of Esther’s life. There is a moving introduction by John Green, author of A Fault in Our Stars, a book said to have been inspired by Esther’s life. This Star Won’t Go Out is also the name of the foundation created by her parents which is committed to ‘helping relieve the financial hardship related to caring for a child with cancer’, something they know about intimately. Undoubtedly, no one will remain untouched by the content of this book. Esther was a creative and lively child whose life inspired countless young people; those she met personally, and others that communicated with her via the many online sites she created and was part of. I found that the second half was the best part of the book. There I saw the real Esther in her friends’ commentaries. They write about the tremendous changes they made in their life due to her interaction and outlook, strong faith, and ‘profound capacity for compassion’. There is her father’s Eulogy, and her mother’s and siblings’ comments about her that form a whole picture of the kind of person she was. One thing that stayed with me was: why was Esther so special? Was it her rare form of cancer that called attention to her? How many children die from cancer each year without us knowing their names and what they could have been capable of had they survived? This grand production and focus on Esther’s suffering seemed to diminish all those others in my opinion. But then I saw the bigger picture. The suffering parents, whose pain multiplied as they helplessly watched their child slip away from them, never gave up. I realized how many lives this book will touch; how many people will find courage and strength from the words between these covers, to fight against the many illnesses that ravage them daily. This book is filled with optimism and hope no matter what one is facing in life. That is what will appeal to readers the most.